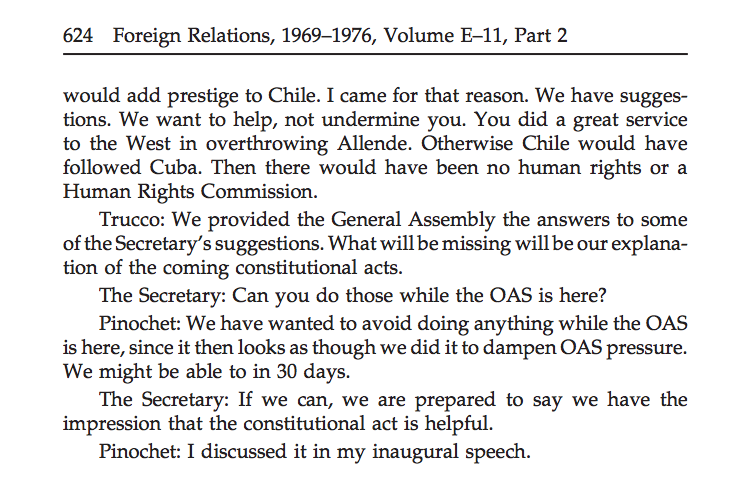 Pinochet’s January 7, 1975 message to Kissinger. Only six months later, again “at Pinochet’s direction,” Contreras returned to Washington on July 5 for yet another secret meeting with Walters. This time he informed him that the regime had decided to cancel a trip by the UN Human Rights Commission to Santiago to investigate the fate of the disappeared, and asked that the U.S. government veto any attempt to expel Chile from the United Nations. Contreras provided details on the “excellent liaison relationships with both the Argentine and Brazilian [intelligence] services with broad exchange of information”—a regional collaboration that would soon evolve into Operation Condor. On Pinochet’s behalf, he also lobbied again for military aid to defend Chile against the pro-Soviet Peruvians, who, he claimed, were working with the Cubans to overthrow the Banzer regime in Bolivia. “President Pinochet would like to see if there is any way the US could arrange indirect military aid for Chile through a third country,” Walters reported to Kissinger. In a meeting at the State Department two months later, Chile’s Ambassador Manuel Trucco complained bitterly that DINA “has a separate channel to Washington,” and that the foreign ministry “had not even known that Contreras was coming” to town. The revelations of Pinochet’s secret communications with Kissinger are contained in dozens of newly declassified documents—an early Christmas present to history from the U.S. State Department’s historical office. On December 18, the Office of the Historian released the latest compilation of the Foreign Relations of the United States (FRUS) series, containing 1000 pages of transcribed documents on U.S. relations with the Southern Cone nations between 1973 and 1976. Among those records are more than 115 documents on Chile, and the early years of U.S. policy toward the consolidation of Pinochet’s bloody dictatorship. “We want to help, not undermine you” excerpt from June 8, 1976 memo – see page 618 of latest FRUS release for full. But the volume also contains many never-seen-before memoranda of conversations, CIA reports, cables and meeting notes that shed considerable light on Pinochet’s operations and U.S. policy toward the consolidation of his regime. And some documents which were previously released with heavy redaction—whole paragraphs blacked out by U.S. government censors—have now been released intact. Through the lenses of U.S. intelligence operatives and analysts, diplomats and high level policy makers, they tell the story of the first three years of Pinochet’s military dictatorship. October 15, 1973 memo on CIA support for Christian democrats – see page 400 in latest FRUS. The coup was widely condemned around the world. 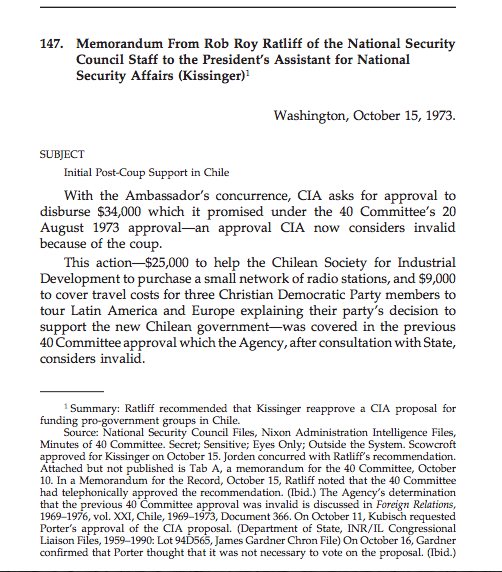 As part of an early covert propaganda effort to cast the new regime in a positive light, the CIA provided $9,000 to, according to the declassified documents, “cover travel costs for three Christian Democratic Party members to tour Latin America and Europe explaining their party’s decision to support the new Chilean government.” The CIA also requested additional funds to help the Chilean Society for Industrial Development purchase a network of radio stations to use in promoting the new regime, and sought $160,000 to assist the near-bankrupt PDC to pay its bills and continue to function as Chile’s leading political party. The CIA’s effort to continue covert funding of the PDC after the coup set off a major debate inside the U.S. State Department, particularly between Assistant Secretary of State for Latin America, Jack Kubisch, and a top aide to Henry Kissinger, Harry Schlaudeman. They argued over the propriety of covert support, and the potential to offend Pinochet vs. the need to keep the PDC going in order to support the new regime. 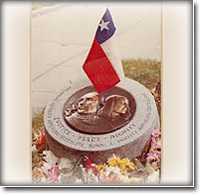 Among the hundreds of Chileans executed in the days and weeks following the coup were two U.S. citizens—Charles Horman and Frank Teruggi. 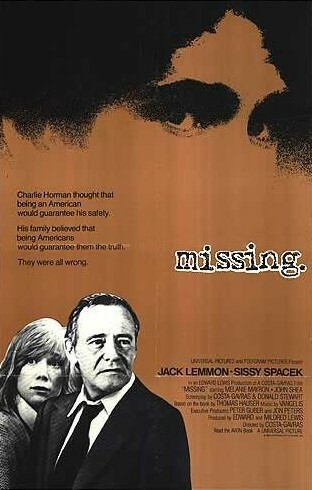 Particularly the case of Horman, the subject of the Oscar-award winning film, MISSING, became a political headache for U.S. officials after the coup. His wife, Joyce, and father, Ed Horman, tenaciously pressured Embassy officials to find him after he was seized by the military at his home and disappeared on September 17, 1973. None of these documents, however, were recovered by the State Department. But this document will allow the family and their lawyers to formally press the CIA to locate Andersen’s records and release them. The new documents collection contains a number of declassified documents on the assassination of Orlando Letelier and the U.S. government’s knowledge of Operation Condor. They include previously released documents that show that Kissinger’s aides learned about Condor and its assassination missions in July 1976, and informed Kissinger in early August 1976. Kissinger authorized a demarche to all the military rulers in the Condor nations. But after his Ambassador in Santiago, David Popper, objected that “Pinochet might well take as an insult any inference that he was connected to such assassination plots,” Kissinger rescinded the demarche. The volume includes a description of a short cable Kissinger sent five days before the Letelier-Moffitt assassination that “instructed that no further action be taken” be taken to protest Condor operations—and a September 20, 1976 cable from his top aide, Harry Shlaudeman transmitting the order to “simply instruct the Ambassadors to take no further action, noting that there have been no reports in some weeks indicating an intention to activate the Condor.” Letelier and Moffitt were assassinated by a car-bomb planted by DINA operatives the next morning. In the wake of a horrific act of international terrorism in the capital city of the United States, Kissinger’s office ordered the CIA station chief to meet with Contreras and effectively give him the demarche that had never been delivered to Pinochet. For the first time, a report on that meeting has been declassified in this volume. 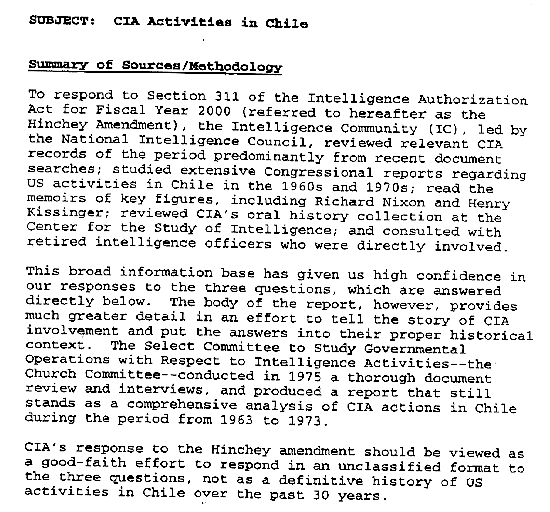 [The CIA] is very worried about reports it has received from various sources on the formation of Operation Condor by DINA and its counterparts in the Southern Cone and Brazil. [less than 1 line not declassified] that according to our reliable information, Operation Condor consists of two elements: the exchange of intelligence concerning extremists and the planning of executive actions—assassinations— against extremists in Europe and other foreign areas. [less than 1 line not declassified] is extremely concerned about the latter aspect. Contreras said that he was aware of our concern. With ongoing legal proceedings for the crimes of Condor in Argentina and Chile, and continuing legal efforts in the Horman and other human rights cases, these new documents continue to be relevant—even if they don’t fundamentally alter our knowledge of the history of Pinochet’s repression and U.S. policy and operations during the first three years of his regime. In effect, these documents provide a chronological roadmap to a particularly painful and dramatic history that, even four decades later, refuses to fully recede into history. 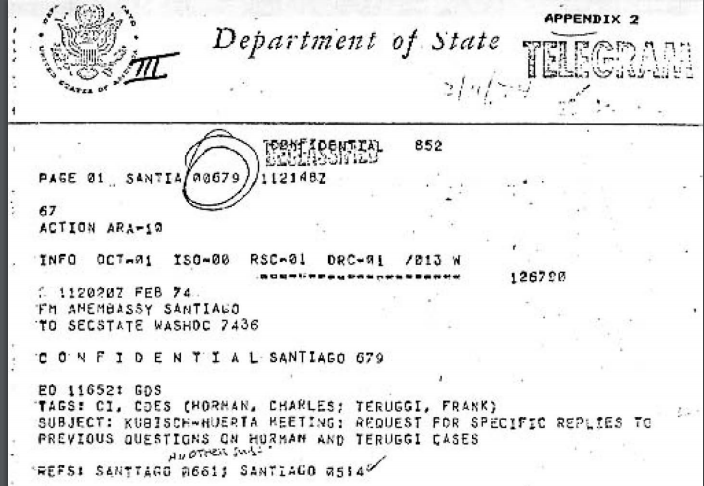 The revelations of these records are sure to stimulate efforts to push for the declassification of more documentation—including Chilean documents because there are still secrets yet to be exposed. Indeed, until the last page of the still-secret historical record is declassified, the history of the U.S. ties to the coup, and to the darkest days of the Pinochet regime, will remain ever in the present. 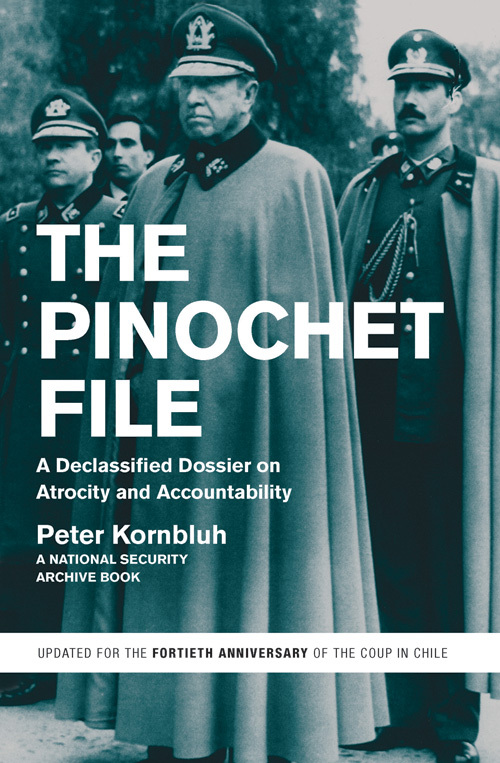 **Peter Kornbluh is a senior analyst and director of the Chile Documentation Project at the National Security Archive in Washington D.C. and author of The Pinochet File: A Declassified Dossier on Atrocity and Accountability (Barcelona: Critica, 2013). All during the time Bush Sr was head of CIA Kissinger was meeting with DINA reps discussing Operation Condor. This war criminal must have been aware of Klaus Barbie’s involvement with Condor and his past as the head of Gestapo in Lyons but few people in this country know of our support for escaped Nazis or that the Nuremberg show trials only tried a small portion of Hitler’s monsters.